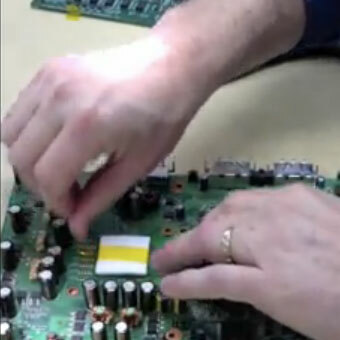 Are you in need of a flexible method for shielding nearby components during the PCB repair process? Do you find yourself looking for an effective heat shielding product which can be easily modified to protect a wide variety of components on your boards without enduring a long lead time? Are you looking for a heat shielding material that is effective and cost-efficient? 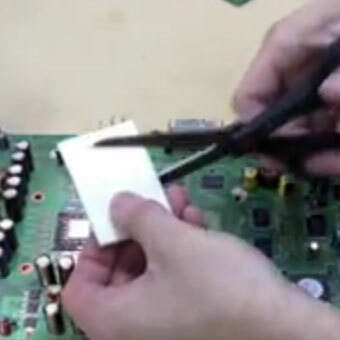 BEST's HeatShields™ are a flexible, effective material which is able to withstand very high temperatures, shielding components such as temperature sensitive connectors, batteries, and electrolytic capacitors in the areas being reworked. Supplied in sheets (6" x 6"), this ceramic based non-woven shielding material can protect sensitive electronic components during extended rework profiles. It is designed to protect adjacent IC components from secondary solder joint reflow due to nearby heat from the rework of assembly process. In addition, it is designed to fit all types of device shapes and sizes. HeatShields™ protect components against excessive heat that can compromise device reliability. See the effectiveness of the Heatshield™ in an article on shielding effectiveness here. HeatShields™ come in packages with several sheets to every package. The shield material is configured to the shape you need by simply cutting the material to the size that you need. 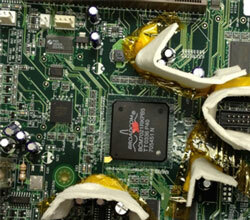 It is affixed in and around those components needing protection with high temperature polyimide tape. By simply blanketing the area in and around the device to be protected and affixing it into position, your components are protected. HeatShields™ are designed for 3 - 5 uses when subjected to direct rework temperature heat sources. Its pliable 1/8' mm walls can be used to place the shield material into tight locations or to wedge it into position so it does not move during processing. Use BEST HeatShields™ to protect your components while enabling high yields. This shield material provides up to 60oC temperature reduction for the adjacent component package body and up to 35oC temperature reduction for the protected component solder joints.